What right did [the House of Representatives] have to pick and choose what part of government is going to be funded? It’s obvious what’s going on here. You talk about reckless and irresponsible. Wow. What this is all about is Obamacare. They are obsessed. I don’t know what other word I can use. They’re obsessed with this Obamacare thing. It’s working now and it will continue to work and people will love it more than they do now by far. So they have no right to pick and choose. Aside from this balancing of fiscal power somewhat in favor of House over Senate, another goal was to make sure the executive did not spend money without congressional authorization. The framers had had experience with kings spending money without being directly answerable to the people, and they didn’t like it. But I strongly suspect that Reid doesn’t really need to be informed of any of this. For one thing, he has a law degree, and that usually indicates at least a glancing familiarity with the Constitution. In addition, he’s been a member of both Senate and House in his career, and he knows the procedures of both bodies. But Harry Reid is well aware of something else: the fact that more and more voters are ignorant of the way our government is set up and of the reasons it was designed that way. So he knows that he can get away with these ignorant-sounding remarks. He is very likely to also realize that some people who actually do know how the government is set up don’t care, or would even like that system changed. Some on the left think it’s archaic and gets in the way of what they want Reid and company to do (see this or this). That’ll teach her to be so impudent. These remarks of Reid’s are the hallmarks of an elected official and a party whose arrogance has swollen to unconscionable and dangerous proportions. Harry Reid and the Constitution: the power of the purse http://t.co/CCR2FQlRqu GOP, Hold the line! Harry Reid and the Constitution: Power of the Purse http://t.co/ZKb97Edxpw The House holds the purse strings. Obama and Reid don't like it. Harry Reid and the Constitution: the power of the purse - http://t.co/79hEPbww03 #justvote? #demandavote? As was intended by all the liberal and leftist teachers who mis-taught generations of American children. Yes they do still teach Civic’s but also remember that it will now be even less effective thanks to “Common Core”, or as I like to call it “Communist Core”. Great Post Neo. Just out of curiosity are you the Neocon that used to post frequently on Redstate? You almost can’t blame the public for not knowing what should be the normal process of governance when you consider that in recent memory Obama, Reid and Pelosi have changed the rules everytime it looked like they wouldn’t get their way. Although they claim to know the constitution – they do not. Case in point the ACA – Obamacare. They was the law was enacted was completely unconstitutional and then we got double whammied by the Supreme Court when John Roberts decided it was. Thanks John! Which brings me to this post and the link I am posting by blogger Fedupusa. He has health insurance provided by his employer and what has happened to him SHOULD be a crime. I get the feeling a lot of crime is going to happen in the future regarding this nightmare ACA. Please take the time to read it and weep for what has happened to our country. I seriously suspect that Roberts was threatened or blackmailed. Textual evidence and court leaks (or a leak, anyway) indicate that he was going to rule against, and then switched late in the process, and Scalia (IIRC) was terribly frustrated that Roberts tuned out his arguments. It seems his about-face roughly coincides with the time Obama was publicly warning the Court to do as he wanted. If the prez would be subtly threatening in public, is there any doubt he would apply serious pressure out of public view? If he’ll send the IRS to punish Ben Carson for challenging his policies, and use multiple agencies to harass someone who’s trying to promote voting integrity, etc., is there any doubt that he would apply full-out thuggery in order to protect the core of his plan to shred the constitutional republic? This is Conspiracy Theory at it’s worst, and is a poor reflection on the academic nature of this website which I enjoy and learn from. To accuse a sitting President, even if you do not respect him, of threatening Roberts in this matter, without any evidence except you thought Roberts was going to vote against Obamacare, is ludicrous. It actually insults Roberts, as anyone who is a person of principles and has the weight of public service that he does would sacrifice everything to bring such an act to light. It isn’t possible to think of Obama as an honorable law abiding person of integrity. He defines a corrupt dishonest tyrant politician. The fact that Obama got himself elected to be “a sitting president” didn’t automatically purify his character, any more than it purified the character of Hugo Chavez or Mohammed Morsi. His formative years were steeped in revolutionary Marxism. He built his political career through an organization that went into banks to intimidate people into changing their lending practices. There are plenty of witnesses to how his supporters used bullying tactics in the 2007-8 caucuses; there’s a whole film about it. It’s a fact that the founder of True the Vote was harassed by multiple federal agencies, clearly for political reasons. It’s a fact that other people have suddenly gotten intimidating audits, for the first time in decades of taxpaying, after they publicly criticized the Obama agenda. It’s also a fact that Obama spoke in a rather threatening way about the Supreme Court’s impending decision. Obama’s roots are in the hard left — with people like Bill Ayers, who (at one time, at least) accepted the idea that innocents might have to be sacrificed as the price of his revolution. Maybe you don’t believe that such people could ever manage to get into power, but that’s a historically blinkered view. And I’m not impugning Roberts’ honor. Honorable people can find palatable explanations for doing what they have to do. I think Roberts made his decision based on the fact that the law was a tax – and that it was conjured up in the senate instead of the house – thereby setting up another challenge in the supreme court to overturn it or that our legislature would have the nuts to correct what was wrong with the law (fat chance of that). I do believe he agreed with the other justices that it was unconstitutional based on the mandate. I would really like to hear his thoughts on it now. This is all happening because there isn’t any compromise by republicans, that is, caving to any and all democrat demands. The day republicans cave is the day the republican party will die. Count down begins in 10, 9. 8…. No Republican statesman is capable of articulating the checks and balances system on which our country was founded, the fact that the House is doing exactly what it is permitted to do under the Constitution and for which it was elected by the people, and that the imperial president simply wants to be able to do everything he wants, when he wants, without opposition or even discussion? Of course, such a statesman would need a forum. The House republicans, at least right now, are the only thing between our current position and totalitarianism. Great piece. You summed it up. More than “some.” I’ve never known a Leftist who didn’t see the Constitution as a fundamental impediment. Really, the hostility to checks and balances is what defines authoritarianism. I’ve just been arguing with some idiots at the Daily Mail (doing my part to spread sanity to the masses). Someone said it’s ignorant to call Obama a dictator because after all he was elected. Many people simply have no concept of constitutionally limited executive power. They really think the president is elected to do whatever he wants (until it burns them personally). The House of Representatives cannot only refuse, but they alone can propose, the supplies requisite for the support of government. They, in a word, hold the purse that powerful instrument by which we behold, in the history of the British Constitution, an infant and humble representation of the people gradually enlarging the sphere of its activity and importance, and finally reducing, as far as it seems to have wished, all the overgrown prerogatives of the other branches of the government. This power over the purse may, in fact, be regarded as the most complete and effectual weapon with which any constitution can arm the immediate representatives of the people, for obtaining a redress of every grievance, and for carrying into effect every just and salutary measure. Time magazine is “out of time.” They’re always 3 decades late and following the latest dumb cluck. They’re be bankrupt like Newsweak soon (misspelling intended). Reid is pro-choice. When did that change? Does he only support choice when the object to be dismembered, vacuumed, and flushed is a clump of cells constituting a human being? What a ghoul. That said, death to the omnibus bill. Government should be accountable and the voting record of our representatives discernible. If Reid does not want to approve the House’s budget, then he, and Obama, own the consequences of their intransigence. This isn’t the first time they used these tactics to force a consensus. Obamacare was conceived through involuntary and superior exploitation. Why is Reid and Obama so obsessed with the life of a clump of policies? The federal government has receipts of $2.6 trillion. Obama cannot unilaterally raise the debt limit without first explaining the distribution of those funds. He set priorities which were incompatible with his duties recorded in The Constitution. An act of premeditated malfeasance may be sufficient cause to impeach and remove him from office. At the moment impeachment for Tyrant Obama’s numerous violations of the constitution and US law is impossible. The progressive fascists who control the Senate don’t care what crimes Tyrant Obama commits. I think the House should refuse to fund government or extend the debt limit until after Obama resigns. You will find this feature in most Bicameral parliamentary systems also. The House of the People is the originator of all legislation. Now if the House GOP would just hold, hold, hold, they will break Obama and the Dems. This constant proffering of compromise to make Obama and the Dems agree is weak. Just offer up single bills. Don’t compromise on Obamacare. Don’t compromise on the debt. I am old enough to remember when the Democrats complained that the House rules gave the majority too much power. Then in 2006 the took back control of the House and immediately adopted the very rules they had complained about. I also remember when Democrats defended the Senate filibuster as a crucial protection from the “tyranny of the majority”. FWIW – the GOP has proven that they are just as guilty of the same hypocrisy. Sure, but that’s not the issue. The issue is whether it is an appropriate use of power to hold the government budget hostage to a dispute over a law that was constitutionally enacted (or worse, threaten the full faith and credit of the United States). Would it be an appropriate use of power for Obama to shut down the government in order to force concessions on a gun control law? The so-called Hastert Rule means that 27% of a single chamber can shut down the government. If the House voted, they would in all likelihood approve the continuing resolution. The Speaker won’t allow it to come to a vote. Who’s holding anything hostage? The House has repeatedly voted to fund the entire government — both the parts it likes and the parts it doesn’t — except this. It’s the Senate and the President that are holding the entire government hostage, refusing to accept the funds the House has appropriated unless they get this additional money as well. That’s like your kid refusing to eat the food you give him unless you give him booze as well, and then calling Child Services to complain that you’re starving him! What the $#@%#^% difference does it make that the ACA was constitutionally enacted? How does that obligate the House to appropriate funds for it? Do you imagine that any time one Congress agrees to a program, all subsequent Congresses are required to keep funding it every year?! Where on earth could you have got such a bizarre idea? Milhouse: The House has repeatedly voted to fund the entire government — both the parts it likes and the parts it doesn’t — except this. That’s right. They know they can’t pass a separate resolution to defund ObamaCare. They won’t pass a continuing resolution including ObamaCare funding. The effect is to hold the government hostage to their demands. They have even suggested they would not raise the debt limit. Milhouse: It’s the Senate and the President that are holding the entire government hostage, refusing to accept the funds the House has appropriated unless they get this additional money as well. That’s right. 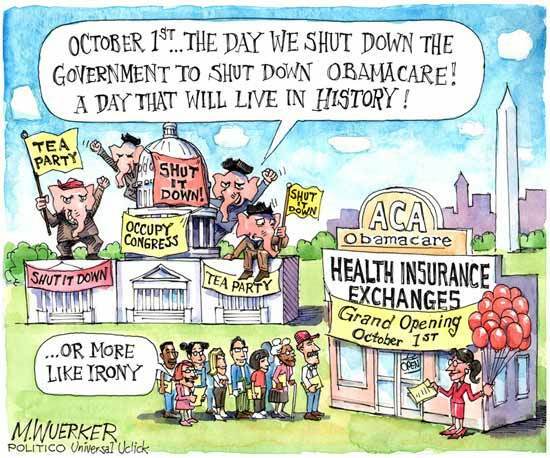 They have said they won’t be held hostage over ObamaCare. It’s a direct attack on separation of powers. Under the Hastert Rule, it means 27% of a single chamber of Congress could make any demands, including making the president stand in the corner with a dunce hat. Would it be appropriate for Obama to shut down the government or put the country into default if he doesn’t get his way on gun control legislation? Milhouse: Congresses are required to keep funding it every year?! Congress can defund or repeal ObamaCare in separate legislation, but it is destructive to the process to hold all other funding or the debt ceiling hostage to their demands. If tax-laws must originate in the House then how did the SCOTUS uphold the individual mandate. The bill originated in the Senate and the House voted on it as is. That right there proves the Affordable Care Act is unconsitutional. Don’t pay your fine, they can’t put everybody in jail! Wrong. The bill originated in the House. Check your facts before opening your mouth.